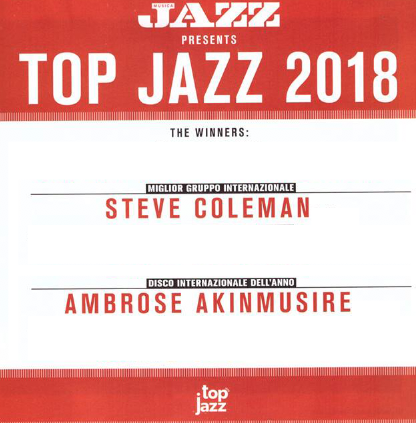 AMBROSE AKINMUSIRE SULLA COPERTINA DI MUSICA JAZZ "dal Top Jazz alla conquista del Mondo"
TOP JAZZ 2018: STEVE COLEMAN E AMBROSE AKINMUSIRE SUL PODIO! Best 20 records released in 2018 according to "Il Giornale della Musica". By Luca Canini ed Enrico Bettinello. 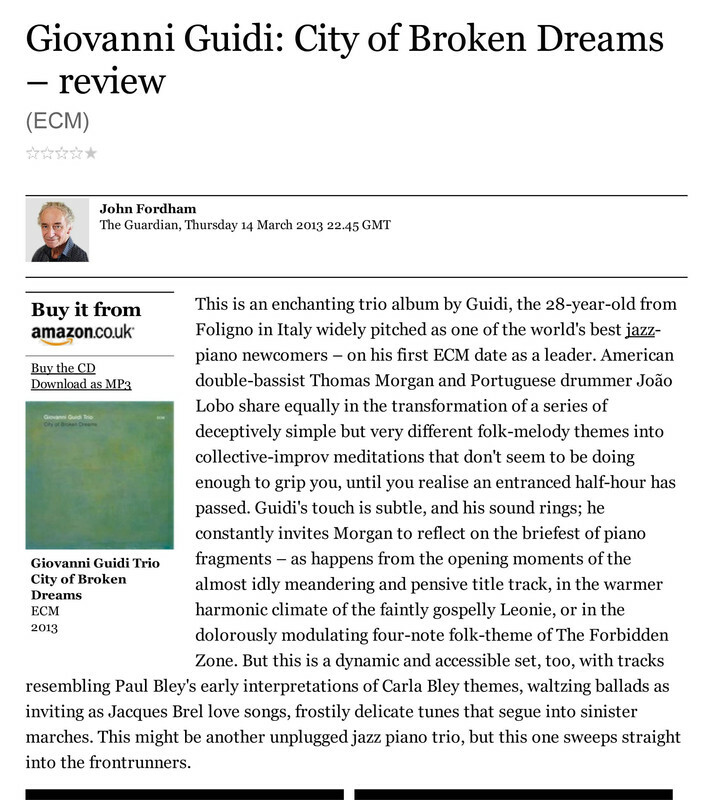 Giovanni Guidi has previously been involved in Enrico Rava’s soundscape at the 2016 LJF (reviewed), and has made impressionistic jazz piano trio recordings for ECM (also reviewed). This electric trio DRIVE! (a pun on Guidi’s surname?) transported us to a different place. Cymbal rushes (Federico Scettri) and bass echoes (Jon Rehmer) recalled In a Silent Way. Dylan’s A Hard Rain's A-Gonna Fall, developed- a country rock version like Bill Frisell’s, but with simmering Fender Rhodes rather than guitar. The slow, powerful backbeat punctuated the open spaces of Guidi’s playing, with its bursts of blues and distorted overtones. The groove disappeared as the massive drum solo (shades of Eric Harland’s thundering sounds) ricocheted off Guidi’s pulsating notes. The pieces merged into each other, (Paul Motian’s It Should’ve Happened a Long Time Ago was in there somewhere) as Diodati and Bearzatti came onstage for some gentle, spacey funk. Horn melodies grew from the full-on rock feel. Then a simple township-like melody had the crowd singing along, as Lento and Severini joined the band. 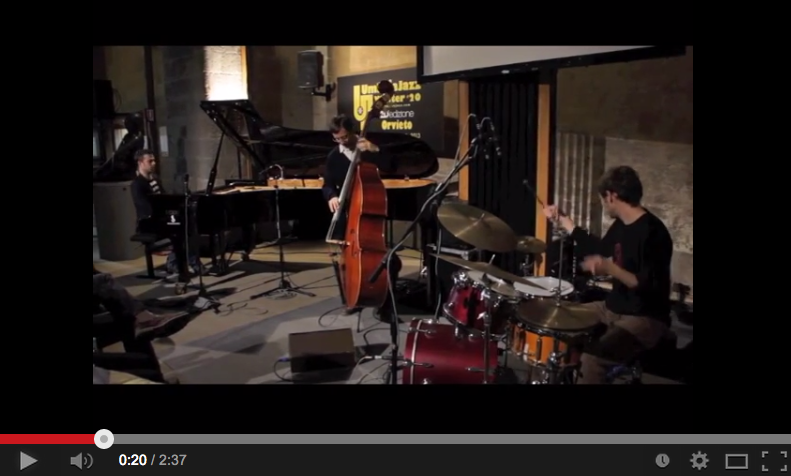 With young musicians like these, you felt the future of Italian jazz was in good hands- and the audience loved it. RAVA is considered among the great Fathers of European Jazz and LOVANO one of the greatest jazzmen of the modern era. The two musicians can be heard in the most prestigious theaters, clubs festivals around the world and their records are published by the most important labels. After 25 years they re-appear together in an exceptional quintet that combines jazz musicians of great value from the US as Dezron DOUGLAS on bass and Gerald CLEAVER on drums and from Italy as Giovanni GUIDI on piano. The original music for this new project is mostly written by RAVA with some tunes composed by LOVANO and some beautiful standard. Two great top players in a single band. Not a jam session or a race or a competition, but a modern personality mix to create distinctive moments of great music. A modern jazz like you have never heard, fascinating and exciting. A real enlightenment of the individual voices of each of these extraordinary musicians. Enrico RAVA, has always been involved in the most different experiences , he appeared on the jazz scene in the mid-sixties, rapidly imposing himself as one of the most compelling soloists of the European jazz. His human and artistic sincerity puts him outside of any scheme and makes a rigorous musician but careless of the conventions. His style is immediately recognizable, his lyrical sound constantly sustained by an astonishing freshness of ideas which are revealed in all his musical endeavors. Dezron DOUGLAS and Gerald CLEAVER are ones of the most creative and reliable rhythm section of the international scene. Their collaborations are numerous: among others, Dezron Douglas with Ravi Coltrane, Eric Reed, Louis Hayes, Gerald Cleaver with Roscoe Mitchell, Miroslav Vitous, Charles Lloyd, Craig Taborn, William Parker. 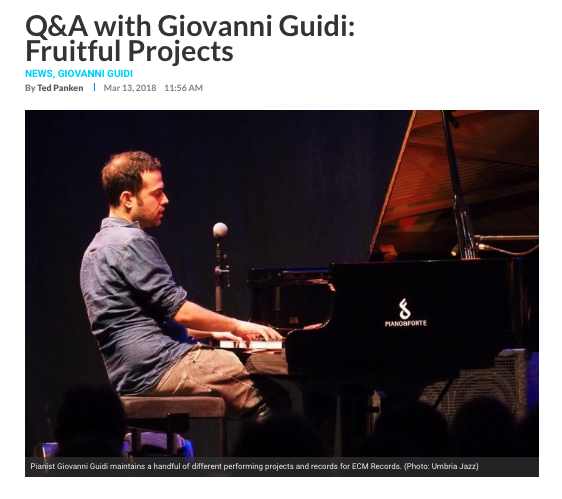 The youngest of the quintet is the 32 year old pianist Giovanni GUIDI, former partner of many adventures with Rava, since he was 19 years old, leading his own groups with whom he recorded three albums already in the house ECM. And he is one of the most respected musicians of his generation, always in search of solutions as an improviser, composer and bandleader. .....Another stunning concert was Giovanni Guidi's 'Inferno' project (below), his approach is more measured and composed than Parisisen's. Featuring beautiful lyrical tunes with compatriot Francesco Bearzatti taking blistering sax solos in another memorable performance. Rava questa volta va a stanare Makiko Hirabayashi dal fronte nippo-danese (la musicista nativa del Giappone risiede in Danimarca) e con lei affronta il suo repertorio, alcuni dei brani a lui più cari. Rava è armato del solo flicorno, che sottolinea il lirismo delle sue opere. Dal ricco canzoniere del trombettista triestino escono sempre cose belle, come Interiors, eseguita con incredibile passione dalla Hirabayashi, che non perde un colpo e tiene perfettamente a mente, nota dopo nota, la scrittura di Rava. Rava imbecca, dà spunti, lancia l’amo e la pianista giapponese abbocca con maestria e tatto, rielaborando con uno stile personale, romanticamente focoso, ogni passaggio. ALL ABOUT JAZZ - "Enrico Rava And Tomasz Stanko: Elective Affinities"
Enrico Rava and Tomasz Stanko have recently launched an ECM super-group with which in July they toured all over Europe, performing in Austria, Belgium, the Netherlands, Norway and Romania, as well as in their native countries, Italy and Poland. 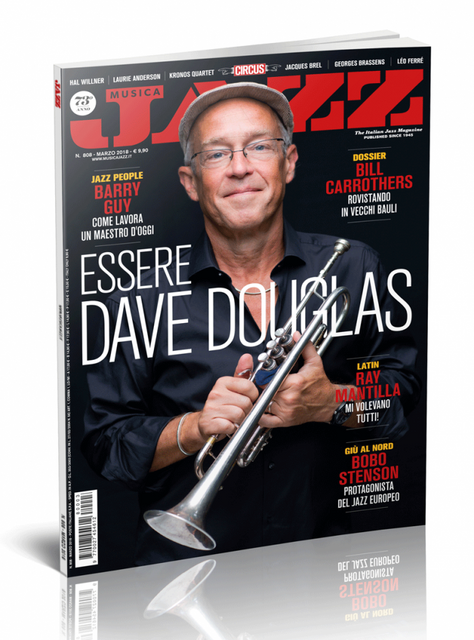 All About Jazz seized the opportunity to ask the two European trumpet masters to set aside some time during their hectic tour and interview each-other, in the spirit of the "Musician 2 Musician" column. What follows is the transcription of their cross-interview, conducted before their concert in Rome, which clearly reveals the sources of their elective affinities. MARK GUILIANA - THE NEW ALBUM "JERSEY" IS HERE ! l Giornale di Brescia - "NOTE RIMISCELATE PER UN TALENTO SENZA CONFINI"
/ MUSICA JAZZ / " Ole'! Il Jazz Flamenco va a New York"
Giovanni Guidi: "Io, il jazz e i miei amici africani a Norcia per i terremotati"
"Jazzmeia Horn harbors both astounding technique and an acute artistic vision…Horn has a thrilling presence with a musical sensibility that strikes a deft balance between mid-century jazz and contemporary neo-soul"
AVVENIRE - "Rava, un cowboy con la tromba"
IL MANIFESTO - "Per i morti di Reggio Emilia, quando il jazz è politica"
A proposito di jazz - " Una fresca ventata di buon jazz italiano"
IDA LUPINO: MIGLIOR ALBUM 2016! JAZZ MAGAZINE - "MANFRED EICHER: L'AVENTURE CONTINUE"
"J'aime beaucoup cet album entièrement basé su l'écoute et le degrè d'interaction exceptionnels dont font preuve les quatre musiciens tout du long. Il est plein de spontaineité, de creativitè et de fraîcheur"
La Repubblica - "Rava: 50 anni da film"
NOISELF - GIOVANNI GUIDI, GIANLUCA PETRELLA, LOUIS SCLAVIS, GERALD CLEAVER "Ida lupino"
INJAZZ - "GIOVANNI GUIDI: Storie di musica e di amicizia"
RAI NEWS - INTERVISTA ad ENRICO RAVA: "La democrazia perfetta esiste... ma solo nel jazz"
La voglia di non fermarsi mai e di andare incontro, ogni giorno, a nuove emozioni in musica. britannico dell'elettronica, ed il pianista Giovanni Guidi. che è diventato un tour internazionale. All'insegna della buona musica tra jazz ed elettronica. NEW ENTRIES: Kayhan Kalhor & Toumani Diabate' ! ON TOUR - NOVEMBER 2017 ! There was an Italian flavour to the EFG London Jazz Festival programme at Kings Place on Thursday night. 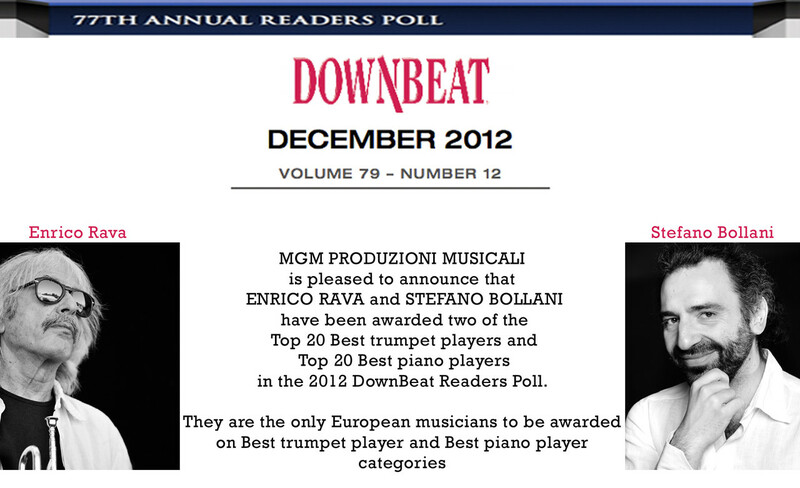 Enrico Rava is an eminent statesman of European jazz, who emerged in the 1960s as a disciple of Miles Davis. He was collaborating with young pianist Giovanni Guidi, also recorded on ECM, though best known for diaphanous soundscapes rather than free jazz at its most raw and bloody. They were joined by electronic music pioneer Matthew Herbert, who now has a distinguished presence across opera, theatre, film and books, as well as improvised electronica. 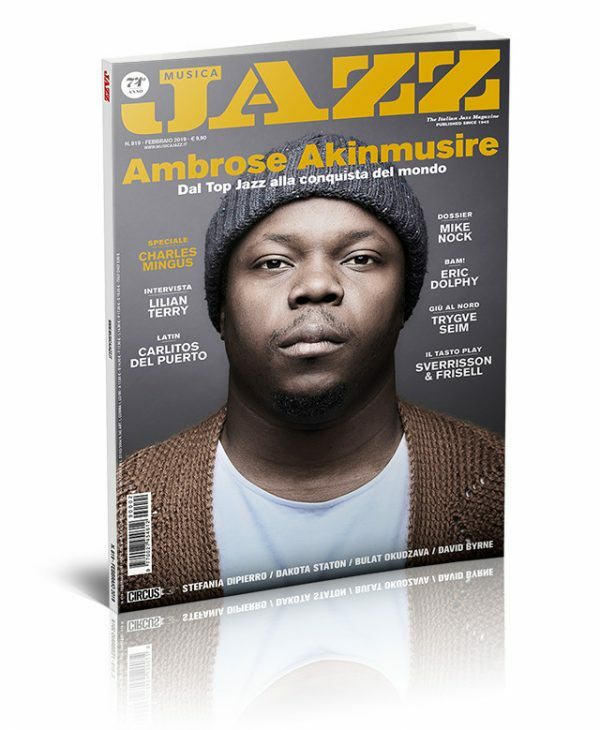 JAZZWISE MAGAZINE - "James 'Blood' Ulmer, Donny McCaslin and Matthew Herbert rule the first week roost at London Jazz Fest"
But the best was still to come at Kings Place with an inspired meeting of the supreme Italian trumpeter Enrico Rava, pianist Giovanni Guidi and the innovative Brit electronica artist Matthew Herbert. They quickly set up a transcendental symphony of Herbert's treated industrial 'found sound' with ghostly nostalgic echoes of film soundtracks (from Lalo Schifrin to Nino Rota), jazz age swing, contemporary classical music and Miles-like flugelhorn sketches. It was out of this world and the one to beat going into the final weekend of the festival. This was serious and very original music. The effect was cathartic, expressing anger and tragedy, as well as beauty and profound musicality. IL MANIFESTO - "Le favole elettroniche di Rava, Herbert e Guidi". Il concerto romano del trio delle meraviglie, tappa di un tour che culminerà con la registrazione a Monaco di un album per la Ecm. Il giornale della musica - "LE ALCHIMIE DI RAVA, HERBERT E GUIDI"
Un connubio di tecnica e sensibilità differenti capace di generare un panorama sonoro cangiante, scaturito da frammenti timbrici accennati dallo strumento di Rava, assorbiti dai microfoni per poi essere rielaborati dai software di Herbert che li ha restituiti, ora dilatati ora compressi, quale tela musicale su cui Guidi ricamava rapidi schizzi pianistici. Questo è stato l’avvio del discorso intessuto da questo trio, che univa la densità espressiva di un musicista come Rava, impegnato a centellinare note segnate da quel timbro così personale, il pianismo immediato, istintivo di Guidi, e la fantasiosa abilità di un alchimista dell’elettronica quale è Herbert, capace – come ha dimostrato lungo la sua carriera – di attraversare i generi musicali ricreandoli attraverso il suo personale virtuosismo di sintesi. Enrico Rava, Matthew Herbert e Giovanni Guidi di nuovo in tour a novembre con cinque date, di cui quattro italiane (l’11 a Reggio Emilia, il 12 a Morrovalle, il 13 a Milano, il 15 a Roma) e un’ultima il 17 al Kings Palace di Londra. Un incontro al vertice tra due guru e un apprendista stregone, che vede impegnati Herbert, osannato maestro britannico dell’elettronica, considerato uno dei più innovativi produttori contemporanei; Rava, il trombettista icona fondamentale del jazz contemporaneo e Guidi, giovane pianista che, nella lunga militanza con Rava, ha carpito molti dei segreti del jazz. Enrico RAVA - Tomasz STANKO 5et European Trumpet Legends - ON TOUR LUGLIO 2017! Enrico Rava - Geri Allen Duo: ON TOUR MAY 2017 ! NEW ENTRIES: QUINTORIGO e STEFANO DI BATTISTA ! “L’album precedente era un omaggio ai ribelli sconosciuti che hanno animato i moti rivoluzionari. Stavolta entriamo nell’ambito della ribellione personale, dei sentimenti, delle emozioni. Andiamo a esplorare l’altra faccia della rivoluzione”. Il live ripercorre varie fasi della carriera del gruppo, diventando una sorta di “best of”. “Ci sono nuovi brani scritti per l’occasione, miei e di Dan Kinzelman, alcuni classici del nostro repertorio e due pezzi sudafricani. È un disco d’amore per le persone, per la musica e per gli amici”. Ribelli dal cuore d’oro. Una performance d’improvvisazione a dir poco stupefacente artisti di fama internazionale, un incontro fra jazz ed elettronica: Enrico Rava, la leggenda della tromba jazz italiano, Giovanni Guidi, considerato uno dei più grandi talenti emergenti al pianoforte, e Mattew Herbert che campiona in presa diretta ciò che viene seguito da Rava e Guidi creando pad atmosferici, e riff taglienti. La loro è una musica come esperienza totale, entità tanto estetica quanto etica. Ma anche, la musica come campo dove sperimentare, prendersi dei rischi, esplorare nuovi territori, stravolgere canoni classici portandoli in un futuro giocoso e spiazzante. Il trailer di "Enrico Rava -Note necessarie": una prima carrellata dei grandi artisti che hanno partecipato al progetto cinemusicale diretto da Monica Affatato, prodotto da Pier Milanese per Cinefonie e Luca Buelli per Pierrot e la Rosa. 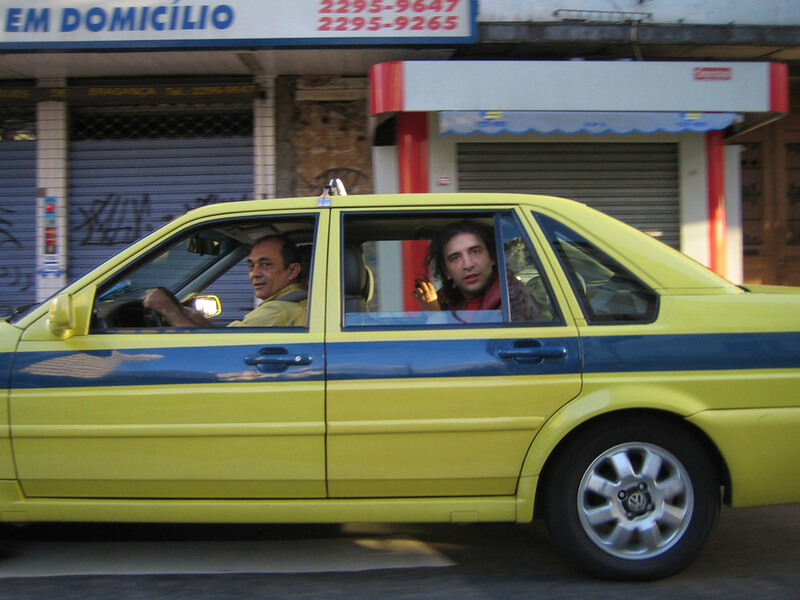 Il film verrà presentato a Bologna in occasione del Biografilm Festival - International Celebration of Lives, il prossimo 12 Giugno. Apertura ufficiale DISTRETTO 38 | Trento/Rovereto! NEW ENTRY 2017: ANAT COHEN "LUMINOSA"
AVISHAI COHEN "Into The Silence" ON TOUR: NOVEMBER 2016 !!! Esce oggi Jazz Italiano Live 2016, Enrico Rava "My Songbook"! ENRICO RAVA NEW 4ET ASIAN TOUR 2016! 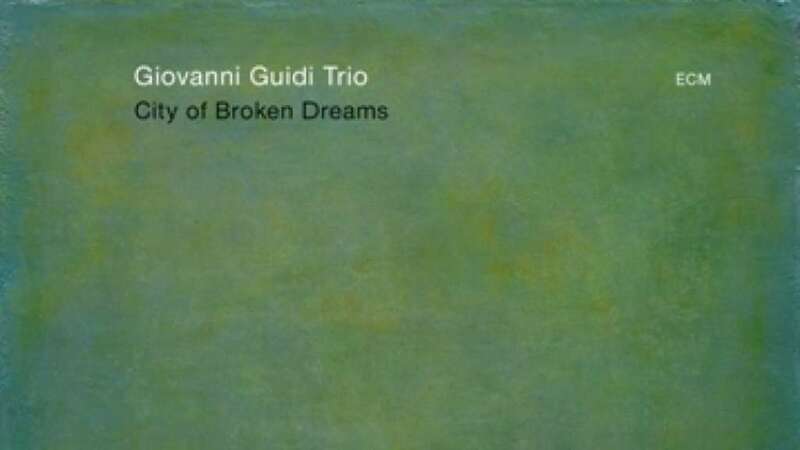 JAZZ RECORDINGS: Giovanni Guidi Trio - "This is the day"
Wild Dance: a Brian Zimmerman review on "DownBeat Magazine. com"
A Matthew Herbert verrà assegnata l’interpretazione della visione futura degli ex spazi industriali. Anch’egli con beats, sonorità post-moderne e accenti ritmici tipici del suo concetto musicale, dialogherà e collaborerà con il pianoforte Jazz di Giovanni Guidi e l’inconfondibile voce solista della tromba del maestro Enrico Rava, raccontando una storia che ancora non c’è, improvvisando su temi musicali di una visione, un possibile futuro positivista, o un’oscura prospettiva di decadenza per la nostra società. Anche in questo caso, l’alternanza tra aderenza al tema musicale e improvvisazione, verrà suggerita da un canovaccio filmico pre-prodotto nei mesi di lavorazione dello spettacolo. 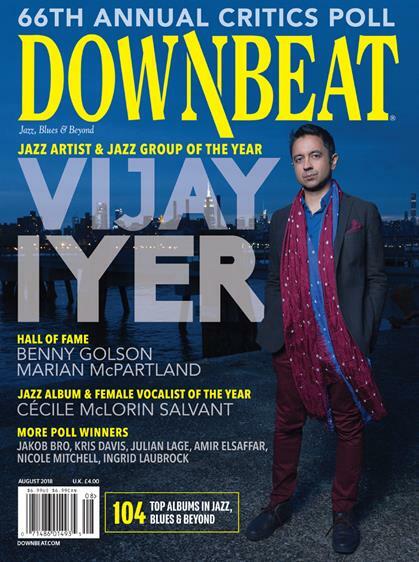 Wild Dance: a Mark Sullivan's review on "All about jazz"
Wild Dance according to "MARLBANK"
"Wild Dance" according to "The guardian"
"A Beautiful Day" di Lou Carlozo. Its name is "Wild Dance" and will be out on next september. It's The brand new album by Enrico Rava and his quartet. Special guest Gianluca Petrella. Here we can listen to the track called "Cornette". A preview of a great album. 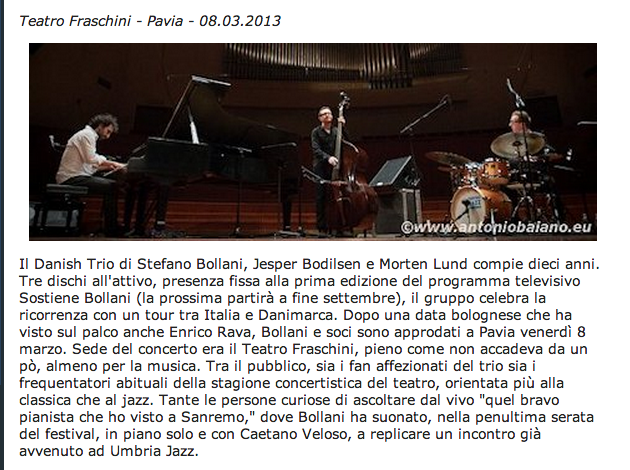 Giovanni Guidi Trio, Umbria Jazz 2015: Thomas Conrad's impressions for "JazzTimes"
Nella spelndida cornice del Teatro Morlacchi di Perugia, l'incredibile incontro tra la tromba di Enrico Rava e il sax di Stefano DI Battista. “L’ incontro tra il sassofonista più romantico del mondo romano e il trombettista faro della scena italiana è sicuramente un confronto potente. Giovanni Guidi: Intervista a "Il Manifesto"
Giovanni Guidi: Intervista a "La Repubblica"
Giovanni Guidi: intervista per "La Nazione"
Giovanni Guidi Trio "This Is The Day". "All about jazz"
This Is The Day. "Il Fatto Quotidiano"
“This Is The Day” è il secondo album per ECM nelle vesti di leader di Giovanni Guidi, pianista italiano dal prodigioso talento. Guidi è già apparso in tre dischi dell’etichetta bavarese , due a nome di Enrico Rava – “Tribe” con il Rava Quintet e il live “On The Dance Floor” insieme al Parco della Musica Jazz Lab - e “City Of Broken Dreams” inciso con il medesimo trio del presente album: il contrabbassista statunitense Thomas Morgan e il batterista portoghese João Lobo. Questo disco è caratterizzato da una musica che colpisce per la sua originalità e per la sua luminosa e intensa emotività. A dare il tono al lavoro sono una serie di fluide e poetiche ballate che hanno il merito aggiuntivo di lasciare spazio ai due co-protagonisti: il bassista Thomas Morgan ha qui la stessa libertà di movimento su cui poteva contare Scott LaFaro nelle formazioni in trio di Bill Evans, o Gary Peacock nel gruppo di Paul Bley. In altre parole sia lui, sia João Lobo, vengono sempre chiamati a interagire con il leader all’interno di brani, tutti scritti da Guidi tranne due standards, che vanno a esplorare spazi sonori inattesi. “This Is The Day” è il secondo album per ECM nelle vesti di leader di Giovanni Guidi, pianista italiano dal prodigioso talento. Guidi è già apparso in tre dischi dell’etichetta bavarese , due a nome di Enrico Rava – “Tribe” con il Rava Quintet e il live “On The Dance Floor” insieme al Parco della Musica Jazz Lab – e “City Of Broken Dreams” inciso con il medesimo trio del presente album : il contrabbassista statunitense Thomas Morgan e il batterista portoghese João Lobo. Questo disco è caratterizzato da una musica che colpisce per la sua originalità e per la sua luminosa e intensa emotività. A dare il tono al lavoro sono una serie di fluide e poetiche ballate che hanno il merito aggiuntivo di lasciare spazio ai due co-protagonisti: il bassista Thomas Morgan ha qui la stessa libertà di movimento su cui poteva contare Scott LaFaro nelle formazioni in trio di Bill Evans, o Gary Peacock nel gruppo di Paul Bley. In altre parole sia lui, sia João Lobo, vengono sempre chiamati a interagire con il leader all’interno di brani, tutti scritti da Guidi tranne due standards, che vanno a esplorare spazi sonori inattesi. Webnotte, Rava il "grande vecchio" del jazz italiano: "Ma mi sento un 18enne"
Enrico Rava e Giovanni Guidi ospiti di Licia Colo'! 29 How long has this been going on? Belgrade Jazz Festival 2013 - Gianluca Petrella/Giovanni Guidi Duo "Soupstar"
The extravagantly gifted young Italian, Giovanni Guidi, appeared in a duo with trombone virtuoso/wild man Gianluca Petrella. 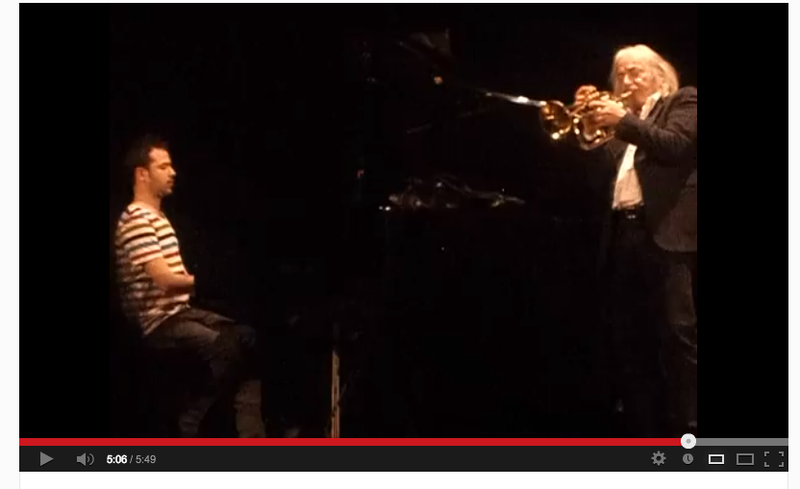 They both play in Enrico Rava’s quintet, and they both pursue their own projects. 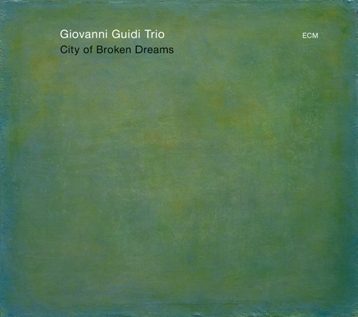 (Guidi has a beautifully understated, daring new album on ECM, City of Broken Dreams.) 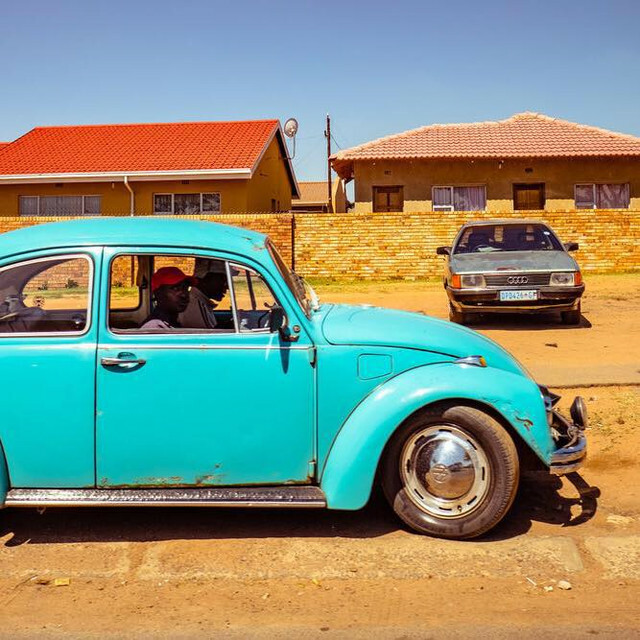 The fact that BJF brought them in as a duo may reflect economics more than aesthetics. Given today’s omnipresent budgetary challenges, many jazz festivals have developed a fondness for solo artists and duos. But putting Guidi and Petrella alone together worked brilliantly, because their fearless imaginations were set free. Guidi was definitely not understated in Belgrade. He splashed and crashed across the full width of the keyboard, and Petrella blasted and squealed, and it all became music. It was a rush when they careened together into “Prelude to a Kiss,” smearing and distorting the song’s tenderness into something hip and hilarious and somehow still heartfelt. Stefano Bollani - Hamilton de Holanda "O que sera'"
Stefano Bollani - Hamilton de Holanda "O que serà"
Bollani - De Holanda: guarda che duo! 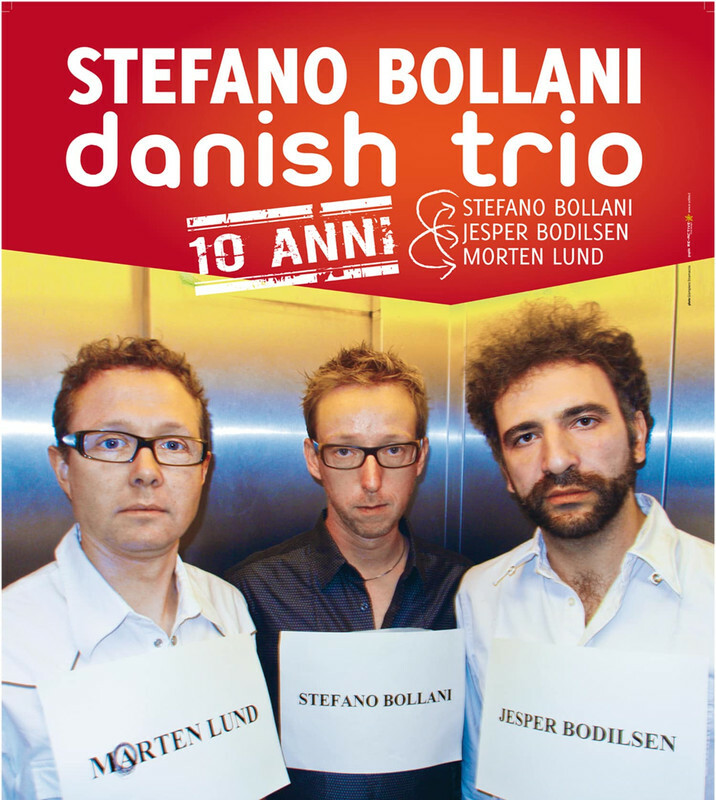 Stefano Bollani e Hamilton De Holanda @Arena Derthona Music Festival 2013! DAMIR DOMA PITTI W12 from Alessandro Tinelli on Vimeo. Non poteva esserci partenza migliore che un concerto di Stefano Bollani per la quinta edizione dell’Aosta Sound Festival, che coi suoi sette concerti, divisi nei due ultimi weekend di giugno, si propone come “festival della musica globale, a 360 gradi”. Il talento di Mr. Guidi - "Avevo il jazz in casa e mi stava antipatico"
Stefano Bollani al teatro Verdi di Firenze, prove di concerto a porte aperte. Hanno partecipato numerosi studenti delle scuole. L'ingresso era gratuito. Un frame dell'esibizione. Stefano Bollani e La Royal Concertgebouw Orchestra di Amsterdam! "La loro musica era il bebop. I loro eroi si chiamavano Charlie Parker, Thelonious Monk, Billie Holiday, Dizzy Gillespie, e ne imitavano il comportamento, la camminata, i vizi e gli eccessi. I loro campi d’azione erano la strada, i loft semiabbandonati, i club di jazz, la notte. Il loro mito era il viaggio senza destinazione, sia fisico che mentale, quindi le droghe e l’alcool. Dividevano il mondo in Hip, quelli che fanno le cose giuste nel momento giusto, e gli Square, cioè gli altri, i borghesi. Erano i nonni del movimento Hippy- Ho voluto evocare tutto questo : la beat generation e i suoi sviluppi utilizzando anche elementi sonori che si sarebbero ascoltati molti più tardi. La presenza dell’orchestra sinfonica, per sua natura l’esatto contrario di una orchestra jazz, mi ha stimolato ad addentrarmi in zone per me inusuali, grazie anche alla straordinario lavoro orchestrale di Paolo Silvestri." Un trio jazz si aggira per l'Italia lasciando di stucco con una musica che colpisce per la sua originalita' e per la sua luminosa e intensa emotivita'. 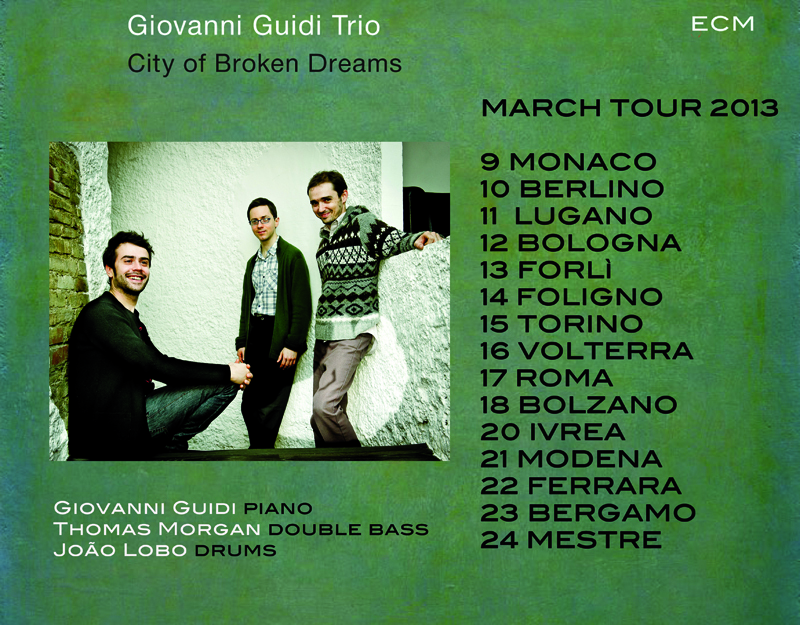 "City of Broken Dreams" e' l'esordio per Ecm nelle vesti di leader di Giovanni Guidi, pianista italiano dal prodigioso talento, affiancato dal contrabbassista statunitense Thomas Morgan e dal batterista portoghese Joao Lobo in una tournee che, dopo aver toccato Monaco di Baviera e Berlino, li portera' il 12 marzo a Bologna, il 13 a Forli', il giorno dopo a Foligno. Poi a Torino il 15, e il 16 al Teatro Persio Flacco di Volterra, mentre a Roma sara' la Casa del Jazz a ospitarli il 17 marzo. Stefano Bollani e Francesca Senette iniziano a parlare delle città di Copenaghen. Si alternano intervista ed immagini della città. I posti amati da Stefano Bollani. Stefano Bollani "Parliamo di Musica"
"Perche' la buona musica tiene molto tiene molto all'etichetta"
Esce il 15 gennaio per i tipi di Mondadori il nuovo libro di Stefano Bollani: Parliamo di musica. Come non mi hai visto mai", scritto da Cristina Donà e Saverio Lanza, è uno dei due singoli inediti contenuti nel disco "Irene Grandi & Stefano Bollani"
Parte il Tour di Irene Grandi e Stefano Bollani! Il 9 Novembre prima tappa: Teatro Lyric di Assisi! Irene Grandi e Stefano Bollani a "Quelli che..."
Martedì 23 ottobre esce l'intero album "Irene Grandi & Stefano Bollani"
Irene Grandi e Stefano Bollani presentano il nuovo disco! ll 23 Ottobre Irene Grandi e Stefano Bollani presenteranno il loro disco alla Feltrinelli di Torino: appuntamento alle ore 18:00. Il giorno seguente, 24 Ottobre, saranno alla Feltrinelli di Milano alle ore 18:30. Giovanni Guidi su Strumenti Musicali - Speciale - "Il pianoforte: amico o nemico?" Il 23 ottobre "Irene Grandi & Stefano Bollani" sara'in tutti i negozi di dischi! Per ora potete ordinarlo in anteprima su iTunes! Enrico Rava: "Il mio Michael Jackson Un gigante in bianco e nero. Come il jazz"
"La marque de l’album TRIBE d’Enrico Rava : envolées mélancoliques et lyriques, changements de rythmes et de mesures parfaitement maîtrisés, et quelques embardées free. Ce savant mélange donne des lignes mélodiques d’une beauté ensorcelante qui, parfois, dialoguent entre elles, émaillées de palpitantes improvisations. À la trompette, Enrico Rava démontre une fois de plus qu'il est inclassable, et à 72 ans, il réussit à surprendre encore les amateurs de jazz avec son nouvel album : un apogée dans l’œuvre de Rava – mais qui sait ce qui peut encore arriver…"